Home | Serigraphs and Giclee Fine Art | Bruce Ricker | Bruce Ricker Handsigned & Numbered Limited Edition Serigraph:" Carmel Canyon"
Bruce Ricker Handsigned & Numbered Limited Edition Serigraph:" Carmel Canyon"
Image size:31.5 " x 30.5 "
About the Artist: "The painter has a language which translates meaning to the viewer beyond that which the viewer's experience can give." - Bruce RickerBruce Ricker redefines landscape art using a style that he calls epic visionary. A formal education in art and architecture combines with a lucid imagination to result in the unique Ricker style. 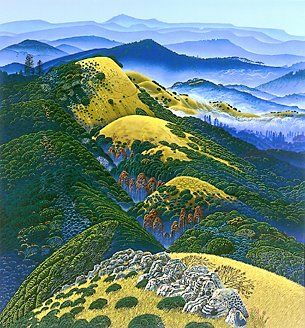 Home | Fine Art Prints & Limited Editions | Gallery Direct Art is your Authorized Chalk & Vermilion Dealer | Bruce Ricker | Bruce Ricker Handsigned & Numbered Limited Edition Serigraph:" Carmel Canyon"